As I pondered the construction of simple wire antennas for my new station I naturally looked at a fan dipole. This is nothing more than a multiplicity of dipoles sharing a common feed point. It is simple, cheap and extendible to multiple bands. Any dipole's DX performance depends on height: the more the better. You could, in theory, tilt the fan dipole on its side to make it a primarily vertical radiator, but this is not a serious contender since it suffers from obvious construction challenges. When I first started playing with these designs I chose to model a fan dipole from bands from 30 meters to 10 meters that could fit on my house roof. I did try adding in 6 meters but gave up because the interactions made it a mess. My roof is not really suited to a 40 meter dipole unless it is shortened by loading, and in any case would do poorly due to the low height. Let's briefly look at just such a fan dipole that I designed for my roof. The EZNEC antenna view can be seen alongside the text. It's a bit difficult to show well since, other than looking straight down on it, the wires look like a tangled heap from most viewing angles. I modeled a metal mast (as a 50 mm diameter tube or pipe) to check for interactions. The mast does not touch any of the dipole elements. The coax feed line itself must be isolated from the feed with a common-mode choke, and possibly even with another further along its length (across the shingles then down the side of the roof) since it will strongly couple to the antenna on one or all bands depending on its length and positioning. However this is a topic I won't address in this post. 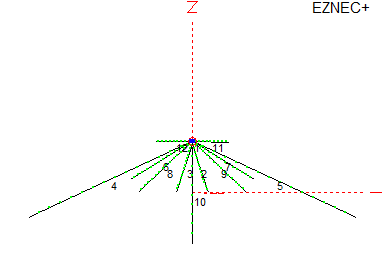 Please take note that NEC2 has some limitations when it comes to 2 or more wires that are joined at acute angles. The EZNEC documentation discusses how to deal with those difficulties. I addressed most of those in my model so the results should be reasonably correct. An interesting aspect of the fan dipole is the relative degree of non-interaction among the elements. Where the bands are not harmonically related there is very little current flowing on other than the two dipole halves that are cut for that band. One important benefit of the low interaction is that for the most part each element can be designed as if not part of a dipole array, requiring little tweaking in the design or, ultimately, once erected. The mast is 4 meters long and shows low induced current on all the listed bands, and therefore is not a concern in the design. For a dipole of this type, the one harmonic of real consequence is the 3rd, where a dipole is 3λ/2 in length. With dipoles for 30, 20, 17, 15 and 10, there is only one such case: the 30 meter dipole on 10 meters. This does in fact occur and explains why I decided to make the 10 meter dipole a true horizontal antenna, constructed with aluminum tubing: to get a decent match. 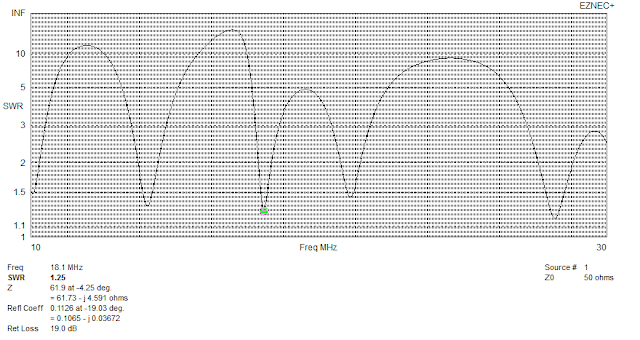 Below is a graph of the antenna's SWR when fed with 50Ω coax. It turns out that, despite being inverted-vees, the antenna matches better when fed with 72Ω coax. That is, except for 10 meters where the match gets worse. With an automated antenna tuner the antenna should match fine as is, suffering little in the way of additional transmission line attenuation due to the mismatch. The radiation angle is poor for DXing, except for the higher bands where it is acceptable though still less than I'd like. On 30 meters the radiation peaks at 30° elevation, and is 10° on 10 meters. There are additional high-angle lobes on 10 meters (contributed in part by the 30 meter dipole), and there is ample unwanted radiation at high angles. But as I said, it's a nice usable simple antenna. In fact I started with just such a dipole for 20 and 15 meters in my very first (1972) station and I worked the world. Yet its height was even lower. I have a little more to say about inverted-vees which I'll leave to my next post.